The World Match Racing Tour has today announced a new Tour Invite Policy for the 2012 season which is designed to ensure the world’s leading professional sailing series continues to attract the best sailors and teams to its World Championship events. 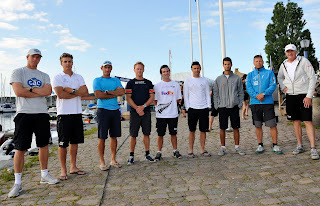 The 2011 Tour Card Holders at STENA Match Cup Sweden. The terms of the new Tour Invite Policy are geared to deliver reciprocal value to both the World Match Racing Tour (WMRT) and its pool of nine Tour Card Holders. Successful applicants will be guaranteed invites to five individual stages prior to the final event of the season and also have the option to secure a Card for up to three years. These changes, coupled with the decision to replace the previous blind bid system with a flat fee, are designed to give teams more certainty when planning their annual racing calendars and also added appeal to current and prospective commercial partners. To help Card Holders demonstrate the level of return on investment each season to their sponsors, each Card Holder is also presented with their own team valuation report created by the Tour’s independent valuation agency. Based on the level of exposure that teams receive across the Tour’s multimedia platform, the individual reports provide not only a team valuation figure but also a valuation breakdown for each of their sponsors. In 2010, the average team value for the Tour’s nine Tour Card Holders across the season was over US$770,000. The Tour is currently building towards the final event, the Monsoon Cup, where the 2011 ISAF Match Racing World Champion will be crowned. Next season, all teams competing on the Tour will have an added incentive to reach the season finale where the US$500,000 bonus prize pool will be awarded across a more even spread from first to ninth place, with the ISAF Match Racing World Champion pocketing US$75,000. A key part of the Tour’s blueprint is for the series to provide its event promoters with access to a consistent pool of the world’s top match racers to ensure high quality racing at their events. The new Tour Invite Policy will therefore adopt a selection model that reflects a combination of performance and marketability. For 2012, the nine Tour Cards will be allocated on three key selection criteria: performance in previous year; rankings; and, an analysis of the team’s ability to add value and consistency to the Tour as a Championship, sports property, media vehicle and as a business. The Tour requires all applications and confirmation of preferred event options to be submitted by 31 December 2011. Tour Cards for the 2012 season will be allocated on 13 January 2012.